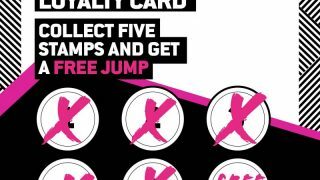 We’re rewarding you Jump Inc addicts with a loyalty card, we know you love Jump so we want to give a little something back. Show us your loyalty card and we’ll stamp it for you when you come in at reception, bounce five times and get your sixth bounce FREE! Book your next bounce and get collecting those stamps!